I wanted to make a tie for Caleb for the wedding and then I thought to myself, why not make one for Bill as well? 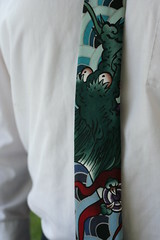 I’ve had this nifty Alexander Henry dragon print lying around for ages, and I thought it would make a nice tie. I like the scalloped design in the background. 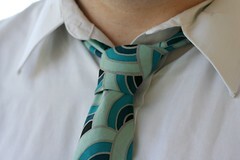 I already reviewed the Burda Osman Tie pattern I used for Bill’s tie in my post Holiday Gifts: Necktie. I went ahead and left out the tie interfacing/interlining as I did in the last version, again this was quilter’s cotton, though not as heavy as the pirate ship cotton from the last post. Bill commented that he really liked the way the tie tapered a little in the middle, it made tying it easy and made a nice looking knot. All in all, the tie took me about an hour to make. Easy Peesy Lemon Squeezy. Caleb’s tie was even simpler. 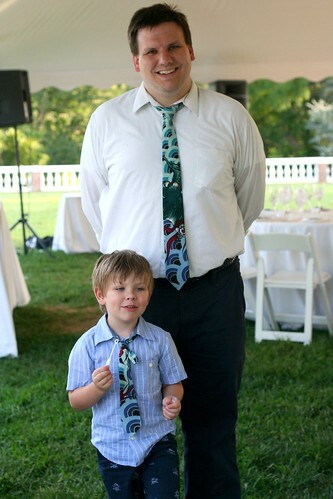 For his, I used the Ottobre Designs Boys Tie Pattern. Once again, take the time to copy it out nicely onto pattern paper – you’ll thank yourself later. Note that Ottobre Designs does NOT include seam allowances, you will have to add your own (don’t forget! ), depending on what you’re most comfortable with. I added just a quarter inch, standard quilting seam allowance. The toughest part of this pattern is turning the whole tie tube inside out after you’re done sewing. I don’t know why I have such a hard time turning tubes. I have any manner of tools to help me with this task and they never seem to work right. I always end up picking the tube out with a pin! At any rate, that is really, really the toughest part. I promise. 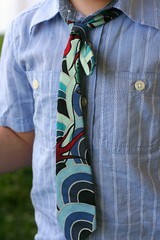 If you have a little boy, I encourage you to make this tie! The tail end sticks out because Caleb kept “adjusting” it. In truth, I think he liked it that way. The tail is a little short to put inside a keeper, I might lengthen the pattern next time so the tie will be long enough for a keeper. 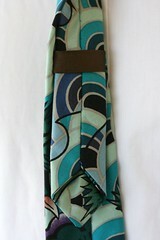 Burda Osman Tie Pattern: ♥ ♥ ♥ ♥ ♥ out of 5. Easy, free and yeilds professional results. 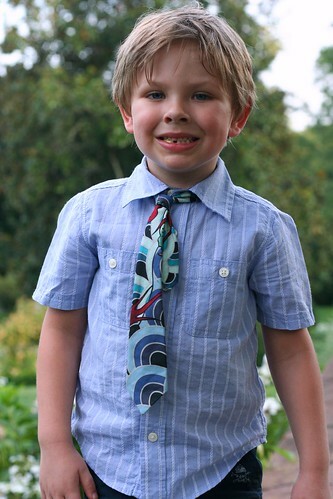 Ottobre Designs Boys Tie Pattern: ♥ ♥ ♥ ♥ out of 5. So easy and free as well, but it needs to be a couple inches longer. Isn’t he a cutie pie? Yes, I’m biased. PS. Yet another To-Do-list project down! Tagged accesssories, Alexander Henry, boy, Burda, burdastyle.com, clothing, cotton, dragon, fabric, free, marriage, menswear, Osman tie, Ottobre Designs, Sewing, tie, wedding.